Our aggregates and cement supply is constantly monitored to not only ensure we offer the highest quality product but that the price is as competitive as possible. The aggregates are supplied in both Bulk (jumbo/tonne) bags and 25kg Mini bags. They are bagged from the same material to ensure minimal variation. 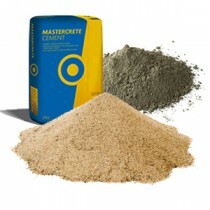 Tarmac are one of the best-known brands in the building industry and we have chosen to stock their products such as Mastercrete, Blue Circle, Snowcrete and limes for that reason. A quality product by a world renown manufacturer.